Resembles Meadow but slightly larger and stockier and with slightly shorter tail; best told from Meadow by voice. 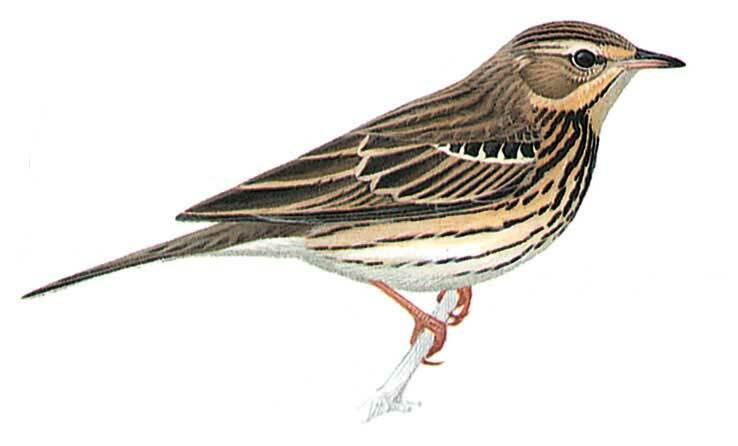 Compared with Meadow, generally warmer grey-brown above (less grey-green), warmer yellow-buff on breast but belly whiter; breast often bolder striped but flanks usually finely streaked (often boldly in Meadow); dark malar and creamy submoustachial streak generally boldest in Tree but moustachial streak fainter; hind-claw shorter, more curved than Meadow. Bounding flight steadier than Meadow’s with longer undulations. When on ground has ‘controlled’ tail-wagging, unlike Meadow’s nervous tail-flicks.